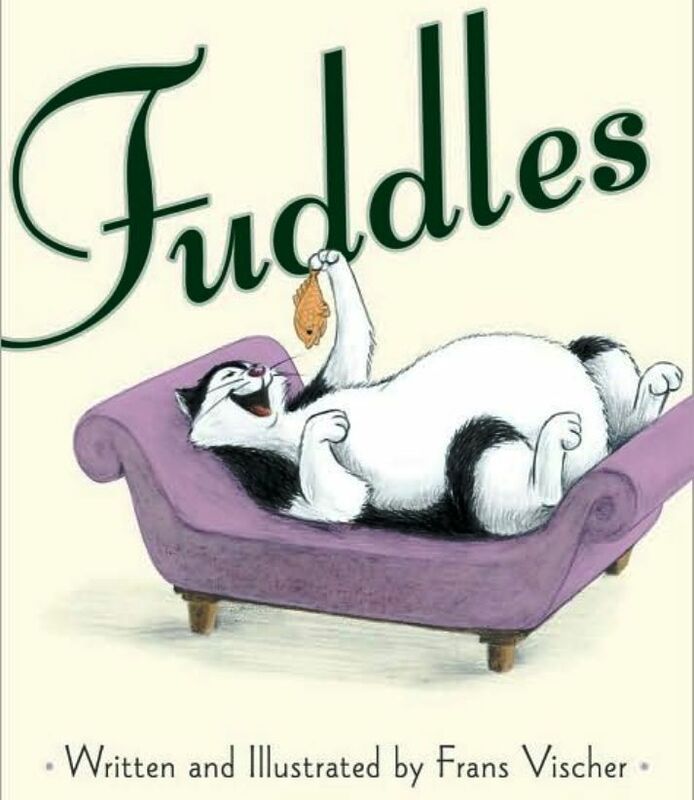 If you are a cat lover or you just happen to love stories about fat and fluffy things that make you laugh, Fuddles by author/illustrator Frans Vischer is the book for you. Fuddles is the story of an adorable cat who has been spoiled rotten by his family. He eats pork chops and prime fish for supper. His fur is blown dry, his nails are painted, and he’s even pushed around in a baby stroller with his fat belly pooching out. In short, he never has to lift a finger — er, I mean a claw — for himself. But unfortunately, this idleness leads to mounds of kitty fat beneath his cuddly fur. One day Fuddles decides that his life needs adventure, so he slips out of the house when the children leave the door open. His plan is to chase birds, climb mountains and face animals from the wild. Instead, he falls in a bird bath, struggles to climb a tree, and comes face to face with a dog who doesn’t want him on his property. Poor Fuddles gets lost running from the dog and must find his way back home before it gets too dark. All he can think of is how much he misses his family, and how much he hopes they miss him, too. Fuddles is an adorable story about wanting what’s just outside your window or just on the other side of your fence. This book brought back memories of my own childhood – how I daydreamed of going to faraway places and experiencing new things, with never a thought to how much I might miss my own family. Readers will easily identify with Fuddles’ daydreams of his own bravado, then his quick transformation to a trembling kitty who wonders what he’s gotten himself into and just wants to go home. Mr. Vischer’s writing style is age-appropriate, realistic and sprinkled with humor. His illustrations of the fat, lazy and oh-so-adorable kitty’s swash-buckling dreams, his hilariously soggy realities, and his sweet vulnerability as he cowers in the darkness waiting for his family to find him will definitely tug at his readers’ heartstrings. This book is perfect for children ages 4 to 7 who are burgeoning cat-lovers, first-time pet owners, or who simply have vivid imaginations. It is also a great jumping off point for discussions about how realities sometimes do not meet our expectations, and understanding the unexpected dangers of running away from home.